Will Jesus prayer for unity ever be answered? In recent weeks as I have been studying the kings of the Bible, that study has included some of the prayers recorded in the Bible, e.g. those of Solomon and Hezekiah. I have never ceased to be amazed and enthralled at the depth of those prayers. If I were to be pressed as to what the greatest prayer is prayed in the Bible, it is the one recorded in John 17, which Jesus prayed shortly before his death. 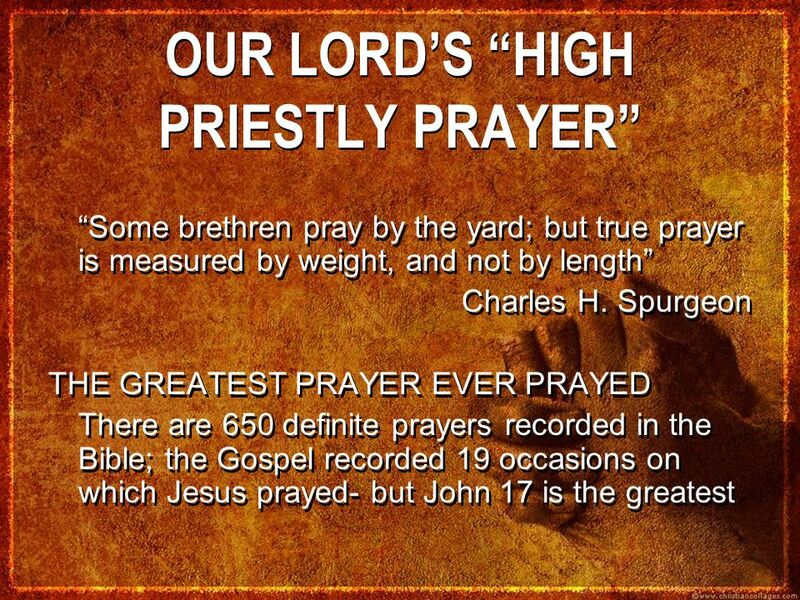 In my youth, it was explained to me as His great high priestly prayer. Knowing what was shortly to befall Him (a cruel death) Jesus prays for His disciples and those who were later to become disciples (including me and real Christians reading this) as a result of the message they were to share. He is concerned they are kept safely as they carry on His work in the world and in particular that they would be united (i.e. be one as Jesus is with His Father). One of the consequences of unity realised is the world will recognize that Jesus is indeed the real deal. This prayer, often over the years, I have reflected on and invariable have noted as one not yet fully answered. Other images about the Church (for that the collective of true Christians is) include Bride, Body and Building, and none of this works fully satisfactorily without unity (oneness). An example of this occurred yesterday when two mature Christian “friends” fell out, nominally over how they viewed Donald Trump and world events. It is not my purpose to elaborate on the great body of evidence of disunity among real Christians, which manifests itself in many and various ways over the millennia, or try to make black white by saying signs of disunity are effectively illusions, but what is bothersome is the effectiveness of the ministry Jesus entrusts to His followers depends, to a large extent, on there being such unity. I do not write from a position of spiritual superiority, given I have played my part in the past in fostering disunity, but rather as one who deeply regrets much of the disunity do I write as I do and resolve to play my part in seeing Jesus’ prayer answered. It should go without saying though, while love is the key it cannot be at the expense of truth. Often Christians in the past have fallen out over what they deem matters of principle whereas often it is more to do with personality. Often too, essential truth e.g. the fundamentals of the Gospel are put at the same level as non-essential truth, the sort we can politely agree to disagree and still remain friends. But the challenge is there and the yearning to see the full reality of Jesus High Priestly prayer: “that they may be one, as we are one”. As for the answer to the original question, the answer has to be yes (how can it be anything else) and the Bible tells us how the end is to pan out – a truly glorious prospect! ← How evil is the evil in the world?